Southwest Heart of the Community Program Makes Great Spaces in More Places! April 27, 2015 /3BL Media/ - Every year, Southwest celebrates Earth Day in a variety of ways—recycling cans inflight, participating in clean-up projects in our communities, and planting new spring trees and flowers at home. This year, in honor of Earth Day, we are proud to announce that the Southwest Heart of the Community Program is growing again! Since our launch in 2014, Southwest has helped communities create and activate new outdoor public spaces in Detroit, Providence, and San Antonio, with additional projects underway in Chicago and Houston. The movement of placemaking traces its roots back to environmentalism. Today, it focuses on building public spaces as a catalyst for sustainable, healthy, inclusive and economically viable neighborhoods strengthened by broad community participation and engagement. The Southwest Heart of the Community Program emphasizes that we reduce environmental impact by challenging individuals to reimagine public space without reliance on major capital projects and overconsumption of natural resources. 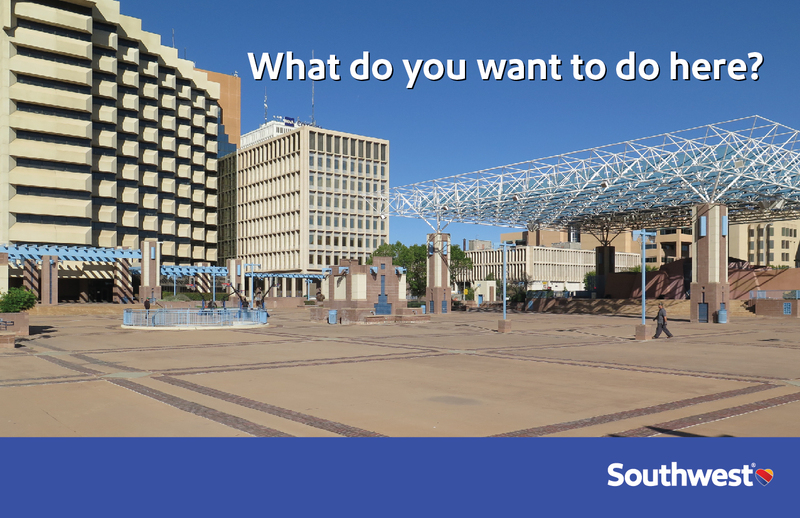 With Southwest’s investment in placemaking, we are taking our commitment to People and Planet to a new level. Today we are celebrating another milestone in our Heart of the Community program as we open our next two newly reimagined public spaces in the cities of San Diego, California and Baltimore, Maryland. Recipients of Heart of the Community grants in 2014, these locations have transformed from empty, underutilized plazas to vibrant spaces that connect local residents, businesses, cultural institutions, and tourist attractions through the use of seating, shade, greenery, and new programming to activate the space. Southwest Leaders, Employees and local dignitaries were on hand to celebrate the new spaces with Earth Day events and activities. We think you’ll agree that the before and after photos are quite astonishing! In addition, we are pleased to announce our 2015 Heart of the Community grant recipients: Albuquerque, New Mexico; Ft. Myers, Florida; Jacksonville, Florida; Milwaukee, Wisconsin; Portland, Maine; and St. Louis, Missouri. These six Heart of the Community spaces were selected through a competitive application and interview process from 38 interested cities. To celebrate, our Employees in those markets participated in volunteer projects around the area where the new spaces will be created. And additional environmental service projects are taking place around the Southwest system over the next few weeks! As a part of their grant, each local partner will receive technical assistance from our nonprofit partner, Project for Public Spaces, to set a clear vision and programming platform for activating the space. The grant also funds a variety of physical amenities, such as tables and chairs, outdoor reading rooms, and information kiosks – bringing new life and vibrancy to these Southwest spaces.